Little Helpers: Animals on the Job! 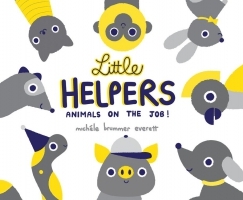 In this book of little helpers, join service animals as they go about their important work. From snakes who give a squeeze when it's time to take medication to Seeing Eye dogs who help their owners cross the street, from llamas who visit children's hospitals to pigs who provide comfort for the elderly, this gentle introduction celebrates special connections between people and animals. A portion of the proceeds includes a donation to charity. Take a peek into the lives of service animals to see the wonderful (and sometimes unexpected!) ways they help people in this diverse and inclusive debut picture book.